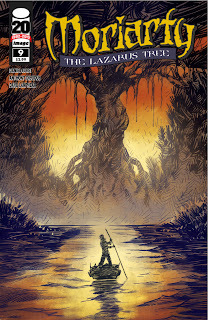 The Fellowship was fortunate enough to obtain a copy of MORIARTY #9 from Image Comics. Daniel Corey writes, Anthony Diecidue pencils, Perry Freeze colors, and Dave Lanphear letters. 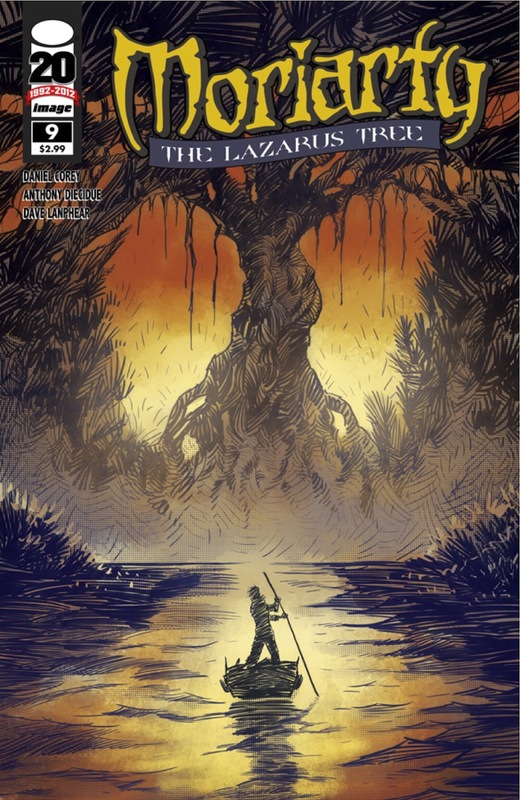 This book wraps up a five-issue arc called The Lazarus Tree, in which Moriarty seeks said tree that allegedly grants eternal life or reverses death. (Moriarty, of course, is none other than Professor James Moriarty, the archnemesis of one Sherlock Holmes.) He finally reaches the tree, runs into an old associate, and gets what he seeks—sort of. This is a story that has maintained my interest; Moriarty is a character which hasn’t really been explored much. Doyle hardly touched him at all in his Holmes stories (he was often talked about, but almost never seen) so it’s fun to see him interpreted in this way. And as you might expect, he proves to be manipulative, devious, vicious at times, and as all-seeing as Holmes himself. The art is good; Diecidue takes us from Victorian England to the jungles of Burma very believeably. Barring a few small anachronisms (not surprising in presenting a Victorian character to a 21st century audience), I like this book. With this arc ending, I’m interested in seeing where the Professor goes next. MORIARTY #9 is available now at your FLCS or by order from imagecomics.com.